Mystery Readers International is the largest mystery fan/reader organization in the world, is open to all readers, fans, critics, editors, publishers, and writers. Started by Janet A. Rudolph in Berkeley, California, it now has members in all 50 of the United States and 18 foreign countries. Members vote each year to nominate and select the winners of the Macavity Award—the 2018 winners have been announced! Join MRI today! Mystery Readers Journal is a quarterly thematic mystery Journal. Each issue contains articles, reviews, and author essays on a specific theme, as well as special columns and other mystery related material. Journals run an average of 80 pages. Subscribe. 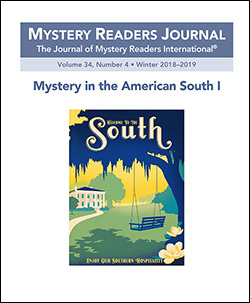 Current Issue: Mystery in the American South I (Winter 2018-19) is available in hardcopy or as a downloadable PDF. Recent Issues: Mystery in Asia (Fall 2018); Spies and Secret Agents (Summer 2018); Gardening Mysteries (Spring 2018). Coming Up: Mystery in the American South II; Murder Down Under; Private Eyes; Italian Mysteries. Submit an article! Mystery Readers Journal shared a link. Study has shown that book readers who read about fiction, drama and romance are nicer, empathetic and kinder. Some therapists recommend this for narcissists who have no ability to empathize with others. This gives them a notion of how empathy works in a non threatening way.